Colourisma: Find Your First Illustration Client... Now on Lulu! Find Your First Illustration Client... Now on Lulu! 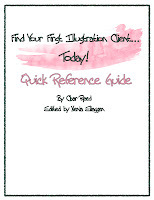 I've provided another way to purchase the Quick Reference Guide! If you love Lulu, it's now available as a digital download for your convenience.